Christopher Creed was the class pariah. When he mysteriously vanishes, Torey Adams feels partially responsible for his disappearance. He, among others, was named in Chris’ supposed suicide note. Unconvinced that he is dead, Torey begins to search for answers with the help of two unlikely allies, Bo, a “bad boy,” and Ally, a girl with a tarnished reputation. After a botched attempt to obtain Chris’ hidden diary. Torey, Bo, and Ally are arrested for the suspected involvement in Chris’ disappearance. When the teens are released, their fervor for finding Chris is increased with the help of his secret diary. The three friends ultimately do not find Chris’ body, but they do find that the adults of their town are full of secrets. Relationships are broken and loyalties tested as the aftermath of Chris’ disappearance rocks the community and brings into question the morality of several upstanding individuals. They discover that things are never as they seem, and reality does not often meet expectations. Although I did not personally enjoy this book, I can certainly understand why it has won so many awards. Nearly everyone has had a Chris Creed in their life, but few have contemplated what it would be like if that person disappeared. The author is never clear what about what happens to Chris, and the reader is left to ponder his fate. In a sense, this lends the book more power, because not knowing is far worse than knowing. This book reveals the harmful effects of bullying and spreading malicious gossip. Many teens are not fully aware of the consequences of their actions and are never held accountable for how they treat others. In this case, there are consequences, and Torey must come to terms with his own role in Chris’ disappearance. His obsession with finding the truth is clearly a manifestation of his guilt, and unfortunately he is never given closure. This is often a sad reality of life. Reader’s Annotation: Everyone wanted Chris Creed gone. Until he actually was. 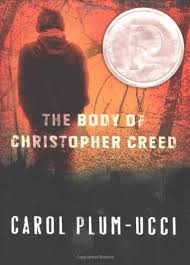 “Carol Plum-Ucci’s seven Harcourt novels have drawn many awards and honors. Her first publication, The Body of Christopher Creed, earned her a Michael L. Printz Honor Book Award in 2002, and she was named a finalist in the Edgar Allan Poe Awards. The sequel, Following Christopher Creed, continues the perils of Steepleton from where 16-year-old Creed disappeared and has never resurfaced. Plum-Ucci received her bachelor’s in communication from Purdue University and her master’s in arts from Rutgers. She has ghost written for six Miss Americas, two CEOs and others who are nameless by discretion. Her many professional awards include a Dalton Penn Award and two Iris Awards for excellence in Miss America publications. She was a recipient of a Kneale Award in Journalism from Purdue University. Talk about the one person that no one can stand in school. Read the content of Chris’ farewell email. Justification of Selection: This book portrays the very real issue of bullying and displays the damaging effects of gossip. It is an suspenseful story with a moral lesson for teen readers.